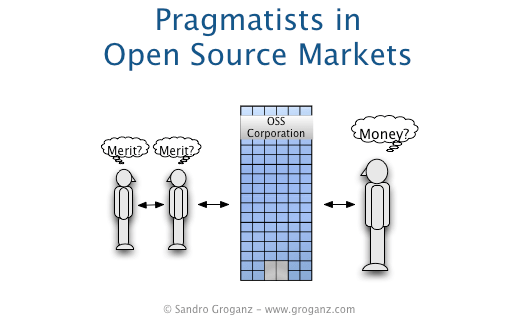 The meritocratic style of Open Source communities can irritate those who simply want to make a deal to raise their own productivity (so-called pragmatists). Highly community-driven projects without at least one strong corporate leader provide too many options frustrating especially those pragmatic buyers who are willing to spend good money for the best services. A community without one ore more strong companies is in danger to alienate pragmatists who don’t want to invest time to become part of that community to later trade merit, but instead want to invest money to benefit immediately from the expertise hidden inside the community. For highly community-driven projects, crossing the chasm also means trading merit for money and building at least one strong corporation to provide the buying experience pragmatists expect (i.e. the whole product). For example, Drupal is still a largely community-driven Open Source CMS project without a strong company taking the place of the cathedral in the bazaar. Where could a potential pragmatic customer turn to if in search for the one and only Drupal service provider with the best expertise, longest and most successful in-market track record and offices around the globe? In fact, things are changing when it comes to Drupal: Acquia sets out to become for Drupal what MySQL is for MySQL. Chances are good they will succeed, given their team and $7 Million VC financing. This means that Drupal can finally line up with those Open Source competitors who are Open Source CMS vendors providing enterprise-grade services, such as Magnolia, Alfresco, eZ Systems. Interestingly, Joomla! (formerly known as the CMS called Mambo) has gone the opposite way by cutting off the one malicious corporate head and letting a thousand small heads grow. It remains to be seen if this puts Joomla! into a good position given the long march towards consolidation in the CMS market. Same goes for Plone, now a true democratic community. Pragmatic customers want to buy the best from the best. They appreciate simple choices and distinct correlations between a product and a company – even if they just want to turn towards that company to check out which other companies provide similar services (e.g. partner companies). In other words: Pragmatists don’t want to search whom they need to talk to. They need a point of reference, even if it is just for comparison sake. Allow me a pointed remark: A “secret society” of community members or a multitude of small companies scares pragmatists away if that’s the only way how they can get an Open Source product up and running. Find more Open Source marketing articles in my Wiki. Although this is often misunderstood, unlike some other examples you mention, Acquia is not planning on going into the consulting business. See “Will Acquia compete with developers and consultants for web development projects?” in the FAQ. So that said, Acquia might not be the model company as a one-stop shop, instead it definitely intends to play best possible with the community, not running home with the ball on its own. Great explanation and some cute diagrams! Dealing with pragmatics, as you describe is an issue in many communities. I’d like to add some data about Plone wich is the world i came from. In Plone you won’t find a worlwide leader but a strong network of companies, every one of them is usually the leader in its own region and you can get in touch with them through plone.net. At the same time the closest role of the worldwide leader in Plone-world is played by Zea Partners, wich is a formal network of Plone/Zope companies. Members of Zea Partners are companies with core developres and different regional leader providers. Then i totally agree that the corporate player have to be strong. In Plone wolrd the big company had been organized in a Institutions, but i think it’s a different solution for the problem you mention. A plus of the democratic organization, a model such as the Plone or Apache foundation is a very elegant way to solve conflicts and problems in community driven products.